Cruise to Shakespeare's Stratford-upon-Avon to watch a play or to Worcester with it's magnificent cathedral. Explore the Midlands, Black Country and the industrial history of Birmingham, Coventry and the North. 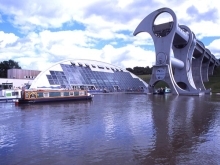 Visit Bath, the Pontcysyllte viaduct on the Llangollen Canal or the Brecon canal in Wales, cruise between Edinburgh and Glasgow - we offer all the most popular British cruising rings. 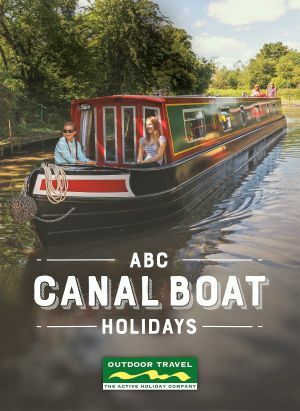 Our traditional narrowboat canal and waterway holidays offer you the very best boating holiday experiences with a host of fleet operators across the country. We offer carefully selected bases, a range of cruising routes and a substantial fleet of fully equipped, crafted high quality narrowboats for hire - independently inspected each year by the English Tourism Council - you are guaranteed quality, fun, safety and a most relaxing holiday. Gliding along the calm canals, you can sit back and enjoy the quintessentially English countryside. Notice the tow-paths where horses and men once pulled the canal boats. Visit picturesque villages where you can find atmospheric country pubs and good eating-places. If you are feeling energetic stop and take a stroll along quiet country walking paths. For those with a taste for history explore Victorian England's industrial heritage from the unique perspective of the canals that were built as part of the industrial revolution. See the Anderton boat-lift a stunning feat of 19th Century engineering, carrying two boats at a time. Discover the urban environments of London, Manchester and Birmingham or the small mill towns of Lancashire from the comfort of a traditional narrowboat. See medieval England in comfort travelling at your own pace. Visit historic Tewkesbury dominated by timber-framed buildings with traditional overhanging eaves and a fascinating maze of small alleyways behind the main streets. Be awed by the beauty of Worcester Cathedral the vision of Bishop Wulfstan at the end of the 11th Century. Or stroll through the streets of Stratford-upon-Avon; the birthplace of William Shakespeare with its spectacular gardens, lively shopping and Royal Shakespeare Theatre Company. Outdoor Travel can help you plan a unique Canal Boat holiday that you will remember for a lifetime. 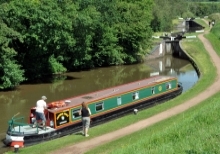 Whilst the canals are narrow, the locks exact and the bridges low the operation of these boats is simple and we have a wide range of boats for you to choose with various cabin layouts - with different bed (double, twin, bunk) and bathroom configurations – from a variety of bases across England, Wales and Scotland. For a FREE QUOTE on your UK boating holiday: Call or email us now with your proposed start date and cruise duration (ie full week, mid-week or long-weekend), your budget, total number of passengers and preferred number of beds/cabins and the region you wish to cruise. Alvechurch in the Midlands is ideal for visiting Warwick with its famous castle and Shakespeare's Stratford-upon-Avon and the world class RSC Theatre. Places of interest that can be visited from Alvechurch include: Black Country Museum, Stuart Crystal Glassworks, Merry Hill Shopping Centre, Tamworth Snowdome, Drayton Manor Park and Zoo, Kingsbury Water Park, Birmingham (Brindley Place, National Sealife Centre, Symphony Hall, National Indoor Arena, Jewellery Quarter Discover Centre, Packwood House (National Trust), Coventry Cathedral, Warwick Castle, Severn Valley Railway, Avoncroft Museum of Buildings, Bromsgrove, Hanbury Hall, Worcester Cathedral, Mary Arden's House (Shakespeare's Mother), Edstone Aqueduct, Pershore Abbey. There is a canal side "Free house" English pub on Alvechurch Marina serving drinks and reasonably priced home cooked bar food. This cosy canal-side pub was once the old Weighbridge office for offloading coal barges to horse and cart for local deliveries. It is now transformed into a friendly hostelry, which is an ideal place to start and finish your holiday. The marina is adjacent to the famous Anderton Boat-lift and situated just outside the Cheshire town of Northwich on the Trent and Mersey canal. 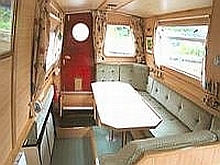 It has lock free cruising to Middlewich and only one lock with a six-inch level difference, connecting to the Bridgwater canal with its lock free run to Manchester. 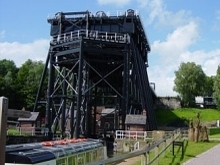 Places of interest that can be visited from Anderton include: Bancroft Mill, Barnoldswick, Skipton Castle, Wigan Pier and Museum, Dunham Massey Hall and Park, Barton Swing Aqueduct, Chester (Roman City), Tatton Park, Anderton Boat-lift, Salt Museum, Northwich, Weaver Flashes, Jodrell Bank Radio Telescope, Macclesfield Silk Museum, Heartbreak Hill, Little Moreton Hall, Eturia Industrial Museum, Consall Nature Park, Alton Towers. Hilperton near Bath and Bristol (ask for route maps). Bath and return, Bristol and return, Bradford On Avon / Bottom of Caen and return, Devizes and return, Hungerford and return, Newbury and return, Reading and return. Hilperton Marina is superbly situated on the Kennet & Avon canal on the outskirts of Trowbridge in Wiltshire. 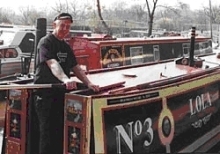 The marina provides excellent cruising in one direction through the quaint town of Bradford on Avon to the world heritage site of Bath (around 8 hours cruising to the West) and on to the City of Bristol mooring in its floating harbour. In the other direction you can go up the magnificent Caen Hill lock flight to the county town of Devizes, on through the ancient Savernake Forest to eventually reach the Thames at Reading. Falkirk in Scotland. Glasgow and return, Bowling and return, Edinburgh and return, Edinburgh and Glasgow. Gayton in rural Northamptonshire in the East Midlands, just an hour or so from London, is an ideal base for a short break where you can find interesting villages, traditional canal-side pubs and restaurants and a 4-day itinerary without locks if that is what you prefer. Longer routes can include Market Harborough and return, Aylesbury and return, The Grand Ring, To Coventry and return, To Snarestone and return, The Warwick-shire Ring, East Midlands Ring. Wrenbury Mill is located by the Llangollen Canal on the outskirts of the village of Wrenbury in Cheshire, which sits between the towns of Whitchurch and Nantwich. For pretty scenery and stunning views, little compares to the Llangollen canal with features including the 1007ft Pontcysyllte Aqueduct. 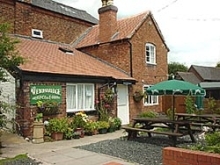 With the proximity of the charming city of Chester as well, visitors starting from Wrenbury Mill are spoiled for choice. The nearby junction at Hurleston is gateway to a rich selection of routes. Goytre Wharf in South Wales for Brecon National Park, Cwmbran, Brecon, Talybont-on-Usk, Crickhowell (ask for route maps). The first impression when you step on board our Canal Boats is of space and light. For people who have not been on a boat before the interior comes as a surprise. When you unpack you'll find we have anticipated your storage needs, with plenty of wardrobes and drawer space, but it's when you start to live on board that our boats come into their own. Central heating. Running hot and cold water to the shower, basin and sink (there are two showers and basins on the larger boats). Flushing toilets. Full cooking facilities and fridges, TV, radio and an inventory of equipment that seems never ending. The controls are as simple as can be - start/stop, forward/reverse, left / right. A child could drive one of our boats - in fact, under supervision, they often do. All our boats are Tourist Board inspected and given an English Tourism Council star rating each year so you can be assured that the highest standards are maintained. 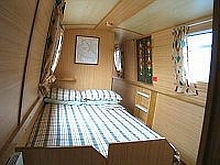 We have a range of Canal Boats from 2-4-berth up to 10-12-berth. We are happy to provide you with advice and information about meeting your holiday needs. 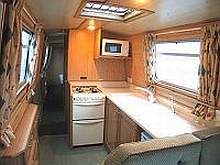 Here is a just a small selection of photos from our many different narrowboats available. 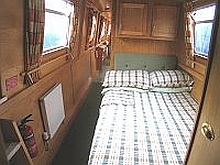 Typical sleeping arrangements & boat layouts: Two Cabins: Choice of a fixed double or 2 low level singles (1 with pipe bed over) in rear cabin, 1 dinette double. General Facilities: Radio Cassette, Colour TV, radiator heating, 250-gallon water tank, 12v mobile phone charging point, cruiser stern, towels and Welcome pack. Kitchen Facilities: Fully equipped kitchen / galley with a 4-burner gas cooker - complete with grill and oven, refrigerator, sink and drainer, work surfaces and plenty of storage space. Bathroom Facilities: Shower, hand basin, shaver socket and a flush toilet. 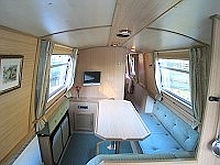 Typically a 49ft Bunting, Eagle or the very comfortable Gull Class narrowboat – with a quiet water-cooled diesel engine and simple drive controls. Full radiator central heating. Hot and cold running water supplied from a 200-gallon water tank. Double filtered drinking water system. A 2kw inverter supplying 240-volt electricity to appliances / sockets on the boat. Carpeting in saloon and bedroom. Security box. Operational instruction and buoyancy aids. Fitted with radio CD player, colour television and DVD player, hair-dryer, vacuum cleaner, 12v Mobile phone charging point, 1 medium size towel per person plus 1 hand towel per bathroom. Welcome pack including a bottle of washing up liquid, dishcloth, tea towel, floor cloth, toilet roll and bin liner. Waterproof clothing and an umbrella is provided for the helmsman. 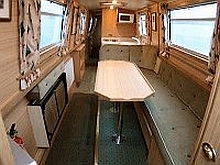 Typical sleeping arrangements & boat layouts: Sleeps up to 5. 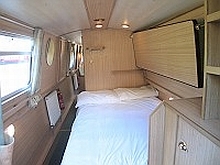 Choice of fixed double beds or two single berths in the forward cabin with interior sprung mattresses, and optional dinette double in saloon. Freshly laundered bedding provided for each person. General Facilities: Fully equipped galley with 4-burner gas cooker complete with grill and oven, refrigerator, sink and drainer, work surfaces and storage space, microwave oven, toaster and filter coffee machine. All the necessary saucepans, cooking utensils, crockery and cutlery are provided. Bathroom Facilities: Bathroom with hand basin, electrically operated flush toilet and hip-bath/shower. 240v shaver socket. 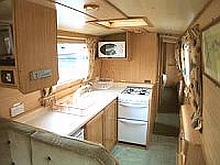 Typical sleeping arrangements & boat layouts: One fixed double, 1 dinette double, choice of double or two singles in each of the rear cabins. General Facilities: Radio / CD, colour TV and DVD, carpet, vacuum cleaner, 250 gallon water tank, 12v mobile phone charging point, 240 volt Sockets, hair-dryer, security box, semi-traditional stern, towels and Welcome Pack. 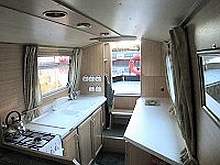 Kitchen Facilities: Fully equipped galley with 4-burner gas cooker complete with grill and oven, refrigerator, microwave oven, toaster, filter coffee machine sink and drainer, work surfaces and storage space. Bathroom Facilities: Two Bathrooms with Hand basin, Shaver Socket, Electric Flush Toilets, Hip Bath/Shower or Shower. Outdoor Travel have a wide range of narrowboats for you to choose with various cabin layouts - with different bed (double, twin, bunk) and bathroom configurations – available from a variety of fleets from a wide range of bases across England, Wales and Scotland. We need to know your proposed start date and cruise duration (ie full week or long-weekend), your budget, and total number of passengers and preferred sleeping arrangements and number of bathrooms and of course your preferred cruise region. We can usually respond to a quote request within 2-hours. For a FREE QUOTE on your UK boating holiday call or email Outdoor Travel or your travel agent with your proposed start date and cruise duration (ie full week, mid-week or long-weekend), your budget, total number of passengers and preferred number of beds/cabins and the region you wish to cruise. Looking for a canal holiday on a traditional English narrowboat but would prefer a crew to look after the locks and all the cooking and cleaning? We offer regular 3 and 4-day cruises along the beautiful English countryside from May to October each year. 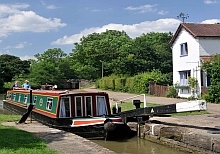 Cruises through the English Midlands include – including the Grand Union, Oxford, Coventry and Ashby Canals – offer the chance to visit favourites such as Stratford-Upon-Avon, Warwick, Stourport, Rugby, Banbury and the heart of industrial Birmingham, a city that is reputed to have more canals than Venice. Outdoor Travel also offers a wide variety of cruising or boating holidays - including hotel barges; self-skippered motor cruisers and Bike & Barge crises - in most regions of the UK and Europe especially destinations such as France, Italy, Belgium, Holland, Germany and Ireland.